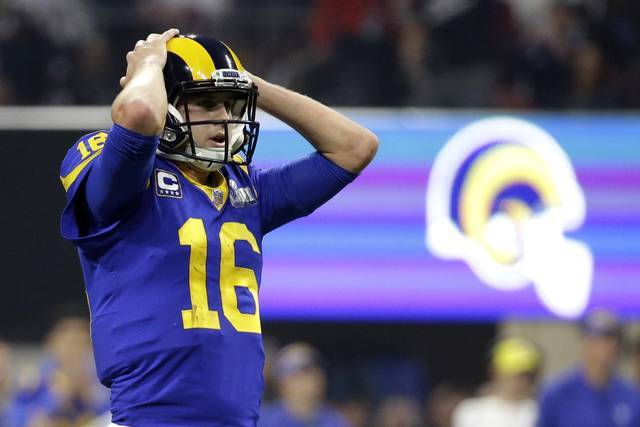 ATLANTA (AP) — Jared Goff trudged to the Los Angeles Rams’ bench, his face betraying confusion and despair while the Patriots celebrated their interception behind him. Sean McVay left the sideline and leaned into his ear. The coach didn’t say much, but he encouraged his quarterback to learn from a disastrous night in the Super Bowl. 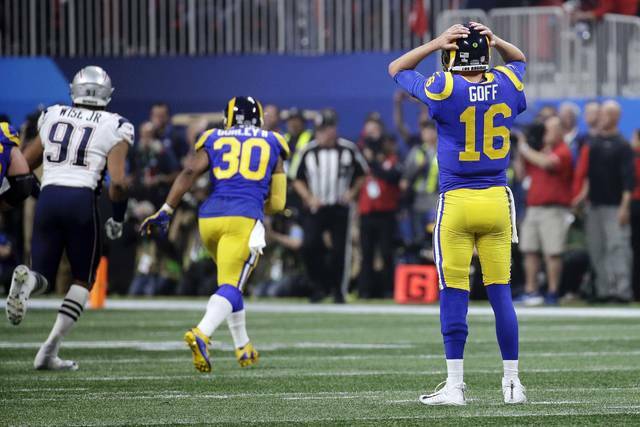 McVay and Goff are likely to be together for many more years, and they hope they’ll remember their embarrassing 13-3 loss Sunday as a springboard to the future, not the crushing flop that it felt like immediately afterward. Goff went 19 of 38 for 229 yards with a key fourth-quarter interception , yet even those pedestrian numbers don’t reflect his full array of overlooked receivers , inaccurate throws and inability to adjust to the Patriots’ defense. Goff played a large role in the Rams’ defeat, yet almost nothing went right for a team that has been frequently brilliant with the ball in its hands. Casual football fans getting their first looks at the Rams at a Super Bowl party probably had no idea how LA got to Atlanta after watching this tentative, inconsistent performance. All of the Rams’ recent success came to a weird anticlimax at Mercedes-Benz Stadium with their lowest-scoring performance in 36 games under the 33-year-old head coach. Though Goff’s teammates and coaches refused to blame him, Los Angeles’ 24-year-old quarterback had one of the rougher performances in Super Bowl history. Along with his 19 incompletions, he was sacked four times, committed a key false start in the fourth quarter and finished with a 57.9 passer rating. Although McVay strenuously blamed his play-calling for putting his players in untenable positions, Goff realized he needed to make more consistent throws and better decisions at the line of scrimmage. Everything was capped by his underthrown pick near the New England end zone, crushing the Rams’ hopes for a tying touchdown with 4:17 to play. Goff had only nine completions in the first three quarters before getting 10 more in the fourth while the Rams’ rally fell short. 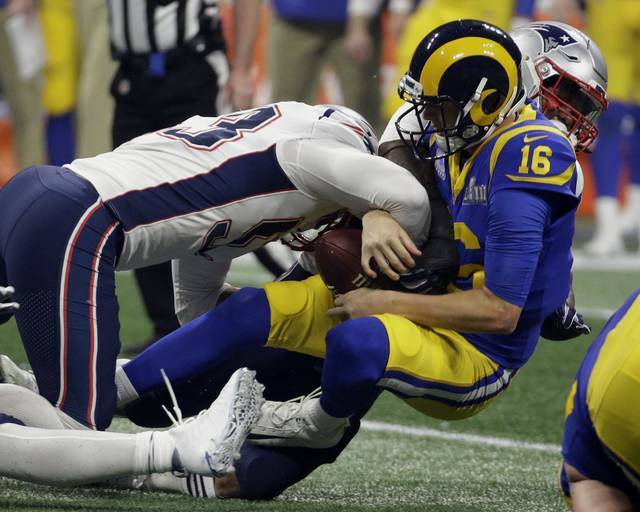 The Rams’ first eight drives in the Super Bowl ended in punts and resulted in only 72 net yards. But with its defense playing brilliantly, Los Angeles still could have taken the lead late in the third quarter when Brandin Cooks broke wide open on a post route. Just like everyone in the Rams’ locker room, Cooks took the blame on himself.